The delegates who met in Philadelphia in 1787 did not agree on the best way to reform the government. The delegates who met in Philadelphia in 1787 did not agree on the best way to reform the government. Some delegates, like James Monroe of Virginia, hoped to strengthen the existing government by amending the Articles of Confederation. Others joined with Madison and Hamilton, who argued for nothing less than a new structure for governing the United States. Once representatives agreed to draft a new constitution, they still disagreed over questions of representation, the relations between state and national governments, and the limits of popular democracy. Even after the ratification of the Constitution and the election of George Washington as president, there was much to do. The Senate, House of Representatives, and Supreme Court had to be organized. The president had to select administrators to help him implement policies and programs. A system for levying, collecting, and distributing funds had to be put in place, and a host of economic problems had to be addressed. Foreign powers and Indian nations needed to be assured that treaties would be honored and diplomatic relations reestablished. A bill of rights, demanded in so many ratifying conventions, had to be drafted and approved. Finally, both proponents and opponents of the Constitution had to be convinced that the U.S. government could respond to the varied needs of its citizens. The fifty-five delegates who attended the Philadelphia convention were composed of white, educated men of property, mainly lawyers, merchants, and planters. Although many delegates had played important roles in the Revolution, only eight had signed the Declaration of Independence two decades earlier. The elite status of the delegates and the paucity of leading patriots raised concern among those who saw the convention as a threat to the rights of states and of citizens. Whatever changes they imagined, all the delegates realized that discussions about restructuring the U.S. government could alarm many Americans, and thus they agreed to meet in secret until they had concluded their business. On May 25, the convention opened, and delegates quickly turned to the key question: Was the convention going to revise the Articles of Confederation or draft an entirely new framework of governance? The majority of men came to Philadelphia with the intention of amending the Articles. However, a core group of federalists, who sought a more powerful central government, met in the weeks before the convention and drafted a plan to replace the Articles. This Virginia Plan proposed a strong centralized state, including a bicameral (two-house) legislature in which representation was to be based on population. Members of the two houses would select the national executive and the national judiciary. The new Congress would retain all the powers held by the confederation, and it would gain the power to settle disputes between states and veto legislation passed by an individual state. According to the Virginia Plan, Congress would not have the power to tax citizens or to regulate interstate or international commerce. Although most delegates opposed the Virginia Plan, it launched discussions in which strengthening the central government was assumed to be the goal. Discussions of the Virginia Plan raised another issue that nearly paralyzed the convention: the question of representation. Heated debates pitted large states against small states even though political interests were not necessarily determined by size. Yet delegates held on to size as the critical issue in determining representation. 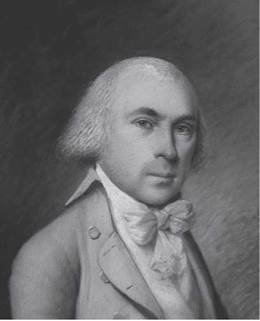 In mid-June, William Patterson of New Jersey introduced a “small-state” plan in which Congress would consist of only one house, with each state having equal representation. Although Patterson’s congressional plan was doomed to failure, he also articulated ideas of constitutional supremacy and judicial review that became key elements in the American legal system. With few signs of compromise, the convention finally appointed a special committee of one delegate from each state to hammer out the problem of representation. Their report broke the logjam. Members of the House of Representatives were to be elected by voters in each state; members of the Senate would be appointed by state legislatures. Representation in the House would be determined by population—counted every ten years in a national census—and each state, regardless of size, would have equal representation in the Senate. The Senate could approve treaties and presidential appointments, try cases of impeachment, and initiate certain kinds of legislation. The House, however, had the singular authority to introduce all funding bills. Included within this compromise was one of the few considerations of slavery at the Philadelphia convention. With little apparent debate, the committee decided that representation in the House of Representatives was to be based on an enumeration of the entire free population and three-fifths of “all other persons,” that is, slaves. If delegates had moral scruples about this three-fifths compromise, most found them outweighed by the urgency of settling the troublesome question of representation. Still, slavery was on the minds of delegates. In the same week that the Philadelphia convention tacitly accepted the institution of slavery, the confederation congress meeting in New York City outlawed slavery in the Northwest Territory. It was perhaps news of that decision that inspired representatives from Georgia and South Carolina to insist that the Constitution protect the slave trade. Delegates in Philadelphia agreed that “the migration or importation of such persons as any of the states now existing shall think proper to admit” would not be interfered with for twenty years. At the same time, northern delegates insisted that the three-fifths formula be used in assessing taxation as well as representation, ensuring that the South paid for the increased size of its congressional delegation with increased taxes. Two other issues provoked considerable debate in the following weeks: the balance of power between states and the central government, and the degree of popular participation in selecting national leaders. The delegates supported federalism, a system in which states and the central government share power. But the new Constitution increased the powers of the central government significantly over those granted by the Articles of Confederation. The new Congress was granted the right to raise revenue by levying and collecting taxes and tariffs and coining money; to raise armies; to regulate interstate commerce; to settle disputes between the states; to establish uniform rules for the naturalization of immigrants; and to make treaties with foreign nations and Indians. But Congress could veto state laws only when those laws challenged “the supreme law of the land,” and states retained all rights that were not specifically granted to the federal government. One of the important powers retained by the states was the right to determine who was eligible to vote, but delegates in Philadelphia decided how much influence eligible voters would have in national elections. Members of the House of Representatives were to be elected directly by popular vote for two-year terms. Senators—two from each state—were to be selected by state legislatures for a term of six years. Voters were also involved only indirectly in the selection of the president. The president would be selected for a four-year term by an electoral college, members of which were appointed by state legislatures and equal to the whole number of senators and representatives to which the state was entitled. Finally, the federal judicial system was to be wholly removed from popular influence. Justices on the Supreme Court were to be appointed by the president and approved by the Senate. Once approved, they served for life to protect their judgments from the pressure of popular opinion. With the final debates concluded, delegates agreed that approval by nine states, rather than all thirteen, would make the Constitution the law of the land. Some delegates sought formal reassurance that the powers granted the federal government would not be abused and urged inclusion of a bill of rights, modeled on the Virginia Declaration of Rights. But weary men eager to finish their business voted down the proposal. On September 17, 1787, the Constitution was approved and sent to the states for ratification. Although the confederation congress neither approved nor rejected the Constitution, it did circulate the document to state legislatures and asked them to call conventions to consider ratification. At the same time, printers published thousands of copies of the Constitution in newspapers and as broadsides. Soon Americans were proclaiming their opinions from pulpits, papers, and other public platforms. In homes, churches, and taverns, ordinary citizens debated the wisdom of abolishing the confederation and establishing a stronger central government. There were many opinions on the Constitution, but the states were not allowed to modify the document, only to accept or reject it in whole. Fairly quickly then, two sides emerged. The Federalists, who supported ratification, came mainly from urban and commercial backgrounds and lived in towns and cities along the Atlantic coast. They viewed a stronger central government as essential to the economic and political stability of the nation. Their opponents, who were generally more rural, less wealthy, and more likely to live in interior or frontier regions, opposed increasing the powers of the central government. Known more for what they stood against than what they stood for, opponents were labeled Antifederalists. The pro-Constitution position was most fully expressed in a series of eighty-five editorials that appeared in New York newspapers in 1787—1788 and were published collectively as The Federalist Papers. Written by James Madison, John Jay, and Alexander Hamilton, these brilliant essays articulated broad principles embraced by most supporters of the Constitution. Most notably, in Federalist No. 10, Madison countered the common wisdom that small units of government were most effective in representing the interests of their citizens and avoiding factionalism. Recognizing that factions were inevitable, he argued that in a large political body, groups with competing interests had to collaborate and compromise in order to rule. This check on the “tyranny of the majority” protected the rights and freedoms of all. Although these editorials did not have a profound impact on delegates during the ratification process, they had a major influence in shaping the government that emerged after ratification. Antifederalists continued to view a large and powerful central government as leading to tyranny, invoking the actions of the British king and Parliament to illustrate their point. Small farmers worried that a strong central government filled with merchants, lawyers, and planters might place the interests of creditors above those of ordinary (and indebted) Americans. Some wealthy patriots, like Mercy Otis Warren of Boston, feared that the Constitution would hand over power to a few individuals who remained isolated from the “true interests of the people.” Finally, many Americans were concerned about the absence of a bill of rights. Constitution. Federalists also gained the support of the most influential newspapers, which were based in eastern cities and tied to commercial interests. Despite the Federalists’ successes, the contest in many states became heated. In Massachusetts, Antifederalists, including some leaders of Shays’s Rebellion, gained the majority among convention delegates. Many were deeply opposed to the centralization of power established by the Constitution. Federalists worked hard to overcome the objections of their opponents, drafting a bill of rights to be proposed for adoption following the Constitution’s ratification. 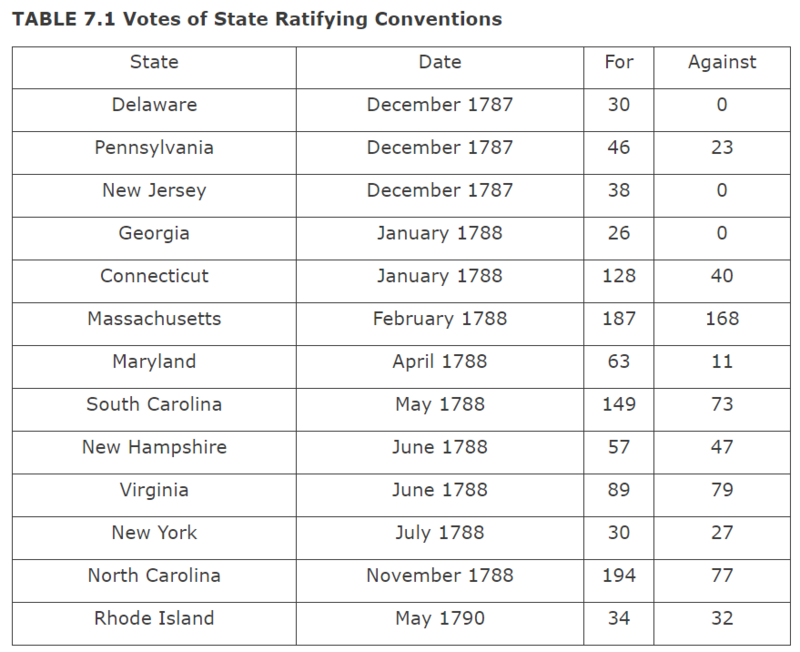 Finally, on February 6, the Massachusetts delegates voted 187 to 168 in favor of ratification. Maryland and South Carolina followed in April and May. A month later, New Hampshire Federalists won a close vote, making it the ninth state to ratify the Constitution. 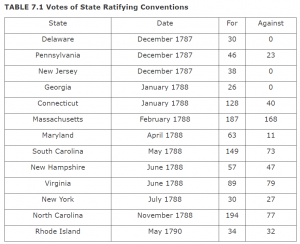 Two of the most populous and powerful states, New York and Virginia, had not yet ratified. Passionate debates erupted in both states. Finally, after promising that a bill of rights would be added quickly, Virginia Federalists won the day by a few votes. A month later, New York also approved the Constitution by a narrow margin. The divided nature of the votes, and the fact that two states (North Carolina and Rhode Island) had still not ratified, meant that the new government would have to prove itself quickly (Table 7.1). Most political leaders hoped that the partisanship of the Federalist/Antifederalist struggle would fade away with the ratification of the Constitution. The electoral college’s unanimous decision to name George Washington the first president helped calm some of this political turmoil. John Adams was selected as vice president. On April 30, 1789, Washington and Adams were sworn in at the nation’s capital in New York City. Washington quickly established four departments—State, War, Treasury, and Justice—to bring order to his administration. Thomas Jefferson was named secretary of state; Henry Knox, secretary of war; Alexander Hamilton, secretary of the treasury; and Edmund Randolph, attorney general, head of the Department of Justice. These men had been major figures in the Revolution and helped draft the Constitution. Congress was also busy in the spring of 1789. The Constitution called for a Supreme Court, but it offered little guidance on its practical organization. The Judiciary Act of 1789 established a Supreme Court composed of six justices along with thirteen district courts and three circuit courts to hear cases appealed from the states. Congress also worked quickly to establish a bill of rights. Representative James Madison gathered more than two hundred resolutions passed by state ratifying conventions and honed them down to twelve amendments, which Congress approved and submitted to the states for ratification. In 1791 ten of the amendments were ratified by the necessary three-fourths of the states, and these became the Bill of Rights. It guaranteed the rights of individuals and states in the face of a more powerful central government, including freedom of speech, the press, religion, and the right to petition. Even as the new government was being organized, its leaders recognized that without a stable economy, the best political structure could falter. Thus Washington’s appointment of Alexander Hamilton as secretary of the treasury was especially significant. In formulating the nation’s economic policy, Hamilton’s main goal was to establish the nation’s credit. This would strengthen the United States in the eyes of the world and tie wealthy Americans more firmly to the federal government. 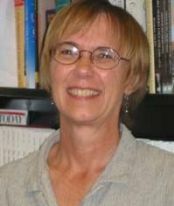 Hamilton formulated a policy that involved funding the national debt at face value and assuming the remaining state debts as part of the national debt. To pay for this policy, he planned to raise revenue through government bonds, an excise tax on goods traded within the United States, and tariffs on imported goods. Hamilton also called for the establishment of a central bank to carry out the financial operations of the United States. His ideas were bold and controversial, but he had the support of Washington and key Federalists in Congress. Hamilton also had the charm and intellectual ability to persuade skeptics of the utility of his proposals and the wisdom to compromise when necessary. In three major reports to Congress—on public credit and a national bank in 1790 and on manufactures in 1791—he laid out a system of state-assisted economic development. Hamilton’s proposal to repay at face value the millions of dollars in securities issued by the confederation to foreign and domestic creditors was particularly controversial. Thousands of soldiers, farmers, artisans, and shop owners had been paid with these securities during the war, but most had long ago sold them for a fraction of their value to speculators. Thus speculators would make enormous profits if the securities were paid off at face value. Madison argued that the original owners of the securities should be rewarded in some way. Others, such as Patrick Henry, claimed that Hamilton’s policy was intended “to erect, and concentrate, and perpetuate a large monied interest” that would prove “fatal to the existence of American liberty.” Despite the passion of his opponents, Hamilton won the day. The federal government’s assumption of the remaining state war debts also faced fierce opposition, especially from southern states like Virginia that had already paid off their debt. Hamilton again won his case, though this time by agreeing to “redeem” (that is, reimburse) the money spent by states that had repaid their debts. In addition, Hamilton and his supporters had to agree to move the nation’s capital from Philadelphia to a more central location along the Potomac River. Not everyone agreed with Hamilton’s plans. Jefferson and Madison argued vehemently against the Bank of the United States, noting that there was no constitutional sanction for a federal bank. The secretary of the treasury fought back, arguing that Congress had the right to make “all Laws which shall be necessary and proper” for carrying out the provisions of the Constitution. Once again, Hamilton prevailed. Congress chartered the bank for a period of twenty years, and Washington signed the legislation into law. The final piece of Hamilton’s plan focused on raising revenue. Congress quickly passed tariffs on a range of imported goods. Tariffs generated some $4 million to $5 million annually for the federal government. Excise taxes placed on the consumption of wine, tea, coffee, and distilled spirits and on the sale of whiskey generated another $1 million each year. Some congressmen viewed these tariffs as a way to protect new industries in the United States, such as the furniture, tobacco, upholstery, hatmaking, and shoemaking industries. Hamilton was most concerned with generating income for the Treasury, but he also supported industrial development. Hamilton’s financial policies proved enormously successful in stabilizing the American economy, repaying outstanding debts, and tying men of wealth to the new government. The federal bank functioned effectively to collect and distribute the nation’s resources. Commerce flourished, revenues rose, and confidence revived among foreign and domestic investors. Hamilton’s support for “infant industries,” expressed in his 1791 Report on Manufactures, also proved prescient even as farmers remained the backbone of the economy for decades to come. From Exploring America’s Histories, Volume 1: To 1877, by Nancy A. Hewitt and Steven F. Lawson (Bedford/St. 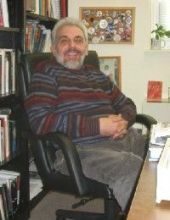 Martin’s, 12.21.2012), published by Erenow, public open access. This entry was posted in Constitution, History, United States. Bookmark the permalink.